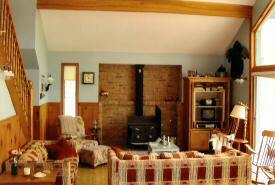 This beautiful cottage is nestled in 25 acres of private forest along a 1/4 mile of secluded riverfront. It is perfect for a family getaway. 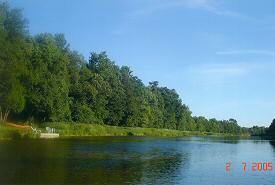 Enjoy nature walks, play in the river, boat, or fish. 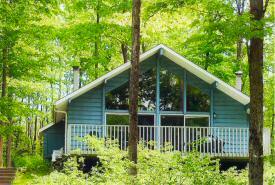 Spend peaceful evenings on the dock watching deer cross at dusk or fireflies by the campfire. Summer theatre, golf, the beaches of Lake Huron, restaurants and Mennonite market gardens are all nearby. Additional photos are availbe upon request. This 1500 sq. ft. cottage is open concept with cathedral ceilings and has just been repainted and renovated with new floors and a new kitchen.. It has 2 private bedrooms each with a new Queen bed. A large loft sleeps 5 with another new Queen bed and 3 Singles. A 12x28 ft. deck overlooks the river. A large lawn for croquet, volleyball and badminton adjoins the cottage. The large concrete dock is a great starting off point for small mouth bass fishing or children to catch crayfish, turtles or minnows. Explore the forest on well-established trails. Along with games for rainy days, we offer a collection of nature books to help identify the hundreds of species of plants and animals found on the property. For a change of pace, the Blyth Summer Theatre, golf, horseback riding, and restaurants are less than 15 minutes away. 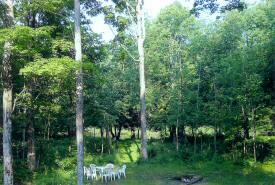 Find peace amidst the soaring trees or outdoor adventures in a secluded natural setting. 2 canoes, concrete dock, outdoor lawn furniture. Cutlery, Dishes, bedding and kitchen linens provided.